John 20:5- And he stooping down, and looking in, saw the linen clothes lying; yet went he not in. John 20:7- And the napkin, that was about his head, not lying with the linen clothes, but wrapped together in a place by itself. Make your rice krispies . Then stuff a plastic egg with the mix. 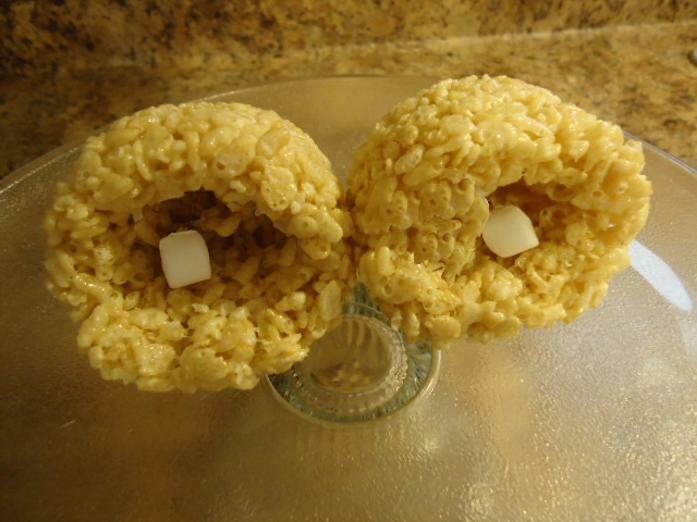 Spray your hands with non-stick spray and then make a hole in the rice krispies. This has to be the easiest recipe I have ever made. I thought this was going to be a lot of work but it really wasn't. Make sure you pack these down in the eggs real good so they will hold it's shape. Stick in freezer to help speed the setting process up. Make 1 tomb for each child and take for children's church or Sunday school. Teach the kids about the resurrection of Jesus for Easter. This will be a hit!